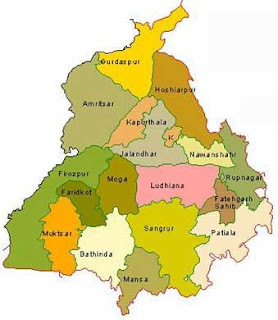 Punjab is one of the 28 princely states of India. As you can see in the below map of India, Its bordering states are Rajasthan, Haryana, Himachal Pradesh, Jammu Kashmir and Pakistan Province of Punjab. Chandigarh is the capital city of Punjab, which is also capital of Haryana state of India. Apart from Chandigarh, Jalandhar, Mohali, Ludhiana, Amritsar and Patiala are the major cites of Punjab state. Agriculture industry tops in Punjab state and thus, Punjab is the largest producer of the wheat in India. Punjab is the state with the lowest poverty rate in India with having top class infrastructure.